The Cross Connection Control Program protects the public drinking water supply in San Mateo County. 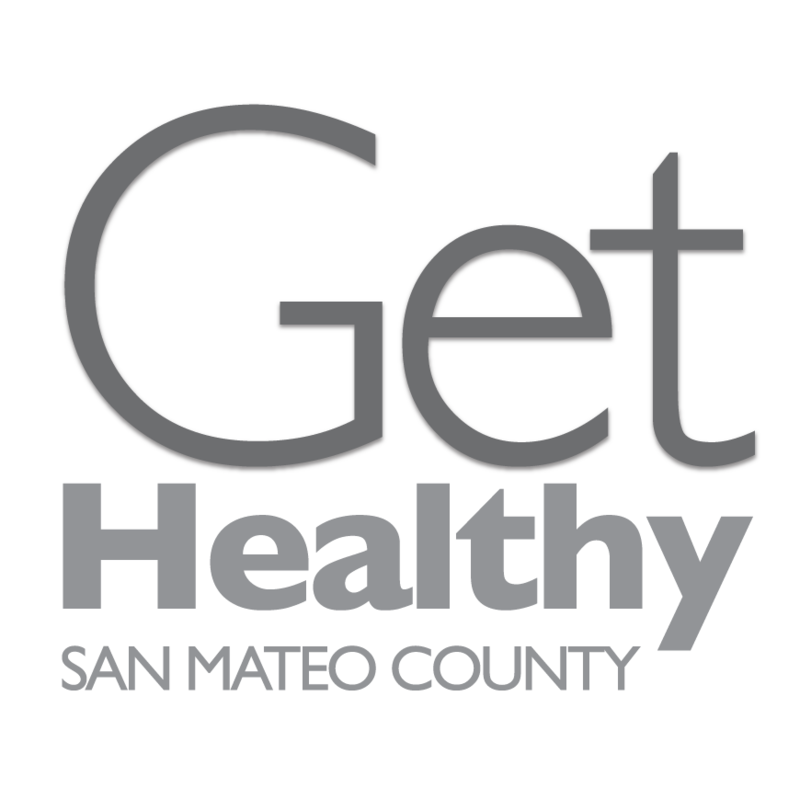 As a part of the San Mateo County Cross Connection Control Program, surveys and/or inspections are conducted at facilities or services that may pose a threat to public health and safety. To eliminate the cross connection or threat to public health, the installation of a backflow prevention assembly may be required in order to abate the public health hazard. A cross-connection refers to an unprotected actual or potential connection between a potable water system used to supply water for drinking purposes and any source or system containing unapproved water or a substance that is not, or cannot be, approved as safe, wholesome and potable. Backflow is the undesirable reversal of flow of non-potable water or other liquids, gases or substances into the potable water distribution system through a cross-connection. There are two types of backflow, backsiphonage and backpressure. Backsiphonage occurs when there is an undesirable reversal of flow of non-potable water that is caused by a reduction in system pressure. This reduction in system pressure can create negative pressure and thus a vacuum condition. For example, backsiphonage could occur if a garden hose is left in a swimming pool and there is a sudden loss of supply pressure. A water main break or fire suppression efforts could create this loss of pressure and create a hydraulic condition where the water from the swimming pool could siphon back into the drinking water supply. Backpressure can occur when there is an elevation of pressure in the downstream piping (by a pump, elevation of piping, steam pressure from a boiler system, air pressure, etc.) that is above the supply pressure. An example of this is a business or home that has a pump connected to the water supply. The pump can increase the water pressure inside the building or property, and allow for the reversal of the normal direction of water flow. 3. What is a backflow prevention assembly and what does it look like? A backflow prevention assembly is a testable assembly that prevents non-potable water from flowing back into (e.g. backflow) the potable water supply. Backflow prevention assemblies protect the potable water supply from actual or potential contamination due to downstream, non-potable uses, such as landscape irrigation, fire sprinkler systems, boiler systems, or alternate water supply (wells, tanks, etc.). Backflow prevention assemblies vary in make, model and size, and may look different from the images attached to the assembly name below. These assemblies must be tested at least annually. The type of assembly required is based on the degree of hazard and hydraulic conditions present. In addition to backflow prevention assemblies, there are backflow prevention devices that, depending on application, can prevent backflow. These devices are appropriate for very specific conditions. Because they cannot be tested, they are not often used to prevent backflow. 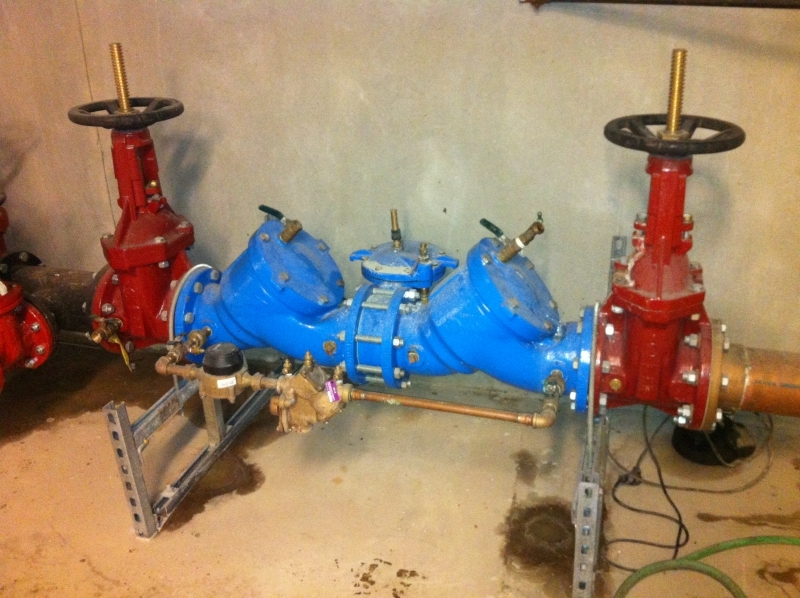 The San Mateo County Cross Connection Control Program requires that all backflow prevention assemblies are approved by the Foundation for Cross Connection Control and Hydraulic Research at the University of Southern California (USC), and must only be installed in an orientation for which they were approved. 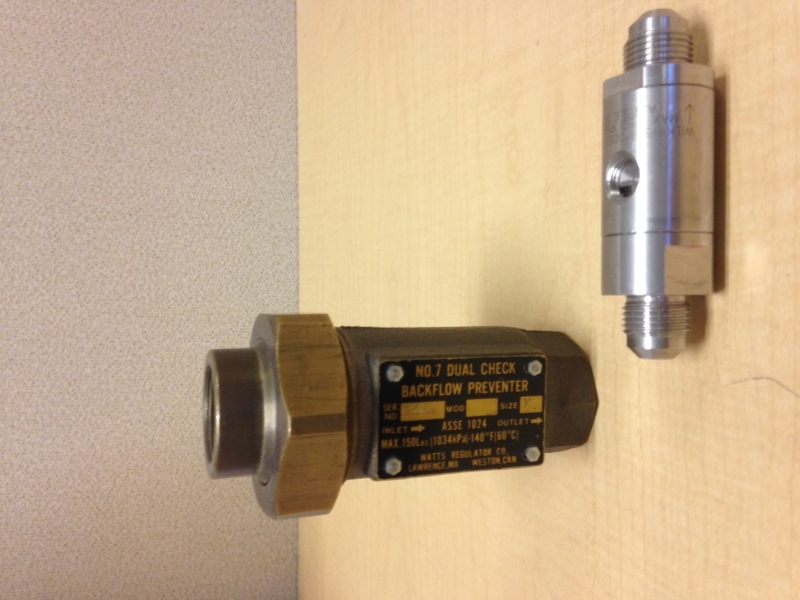 A list of USC-approved backflow prevention assemblies can be found here. 4. 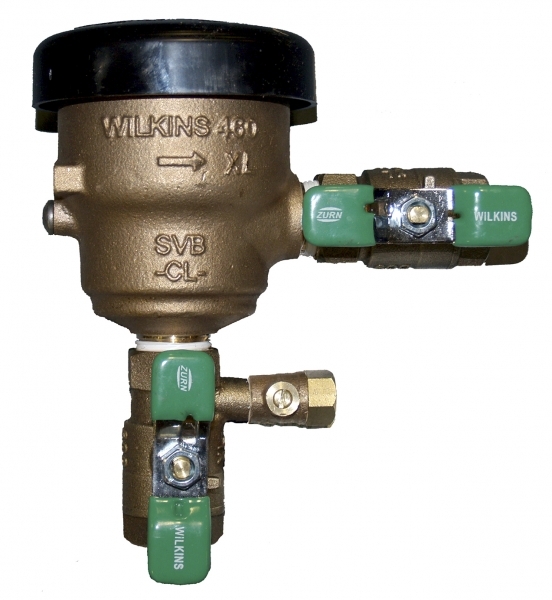 Why do I need a backflow prevention assembly or device? Backflow prevention assemblies and devices stop the undesirable reversal of flow of non-potable water, and prevent a cross-connection. For example, if you have an automated landscape irrigation system, a backflow prevention assembly or device can be installed on the water line supplying water to the irrigation system. The assembly or device can prevent water that is potentially contaminated from the irrigation system from entering back into your home and the public drinking water supply. Whether you need a backflow prevention assembly or device depends on several factors. In some areas, a backflow prevention assembly is required if you are using water for such non-potable uses like landscape irrigation. In some cases, a backflow prevention device like an Atmospheric Vacuum Breaker (AVB) is sufficient if it is properly installed. 5. Why I am receiving a notice to test a backflow prevention assembly? You have received a test notice (or notices if you have multiple assemblies on your property) because Environmental Health’s database shows you or the company you represent as the responsible party of the backflow prevention assembly. We obtain assembly owner information from the water purveyor, the backflow tester (when the assembly is installed and tested for the first time), and/or the San Mateo County Assessor’s Office. Environmental Health implements the Cross Connection Control Program for many of the water purveyors in the County. If you think you have received a test notice in error, please contact Environmental Health Services by e-mail at backflow@smcgov.org. Please give us the property information details and explain why you feel you have you received the test notice in error. 6. 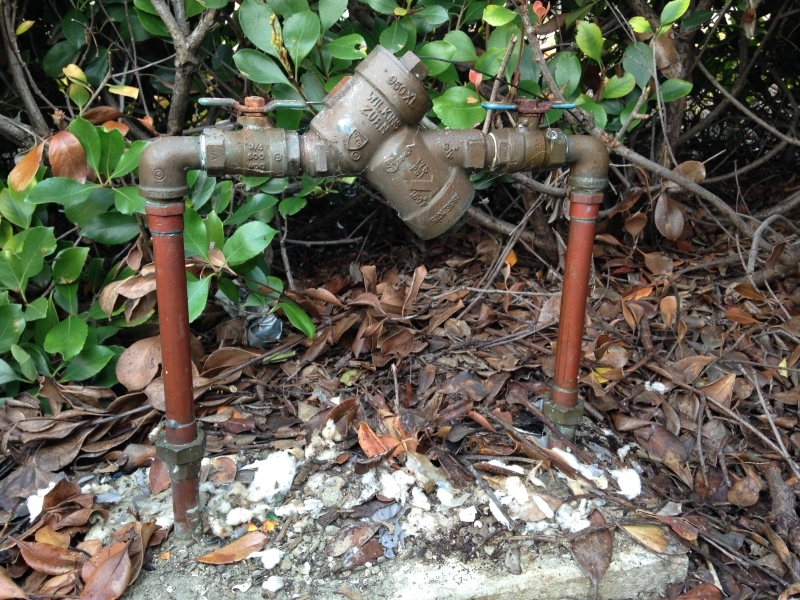 Where is the backflow prevention assembly located on my property? The location of the backflow prevention assembly depends on what type of backflow condition the assembly is preventing. 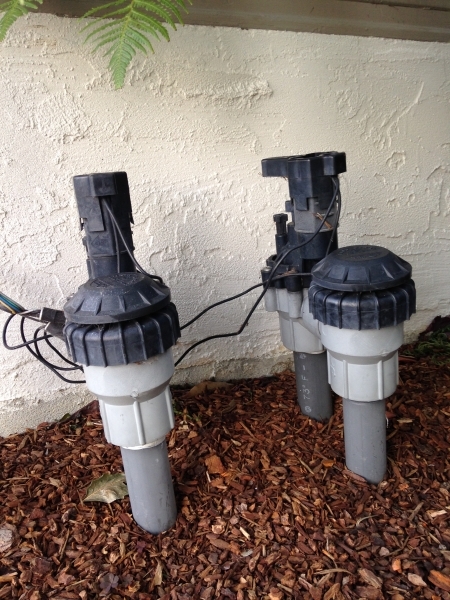 Backflow prevention assemblies are often located directly behind the water service meter. This type of installation is considered water meter protection and is designed to prevent backflow from anywhere on the water user’s premises into the public drinking water supply. Backflow prevention assemblies may also be located on the premises of the water user, installed above any downstream use that could pollute or contaminate the water user’s internal potable water system. An example of this is if the water user has a landscape irrigation system on the property. A backflow prevention assembly may be installed where the potable water supply splits off to supply water to the irrigation system. This type of installation may also have been required as internal protection of the public water supply in lieu of meter protection. Backflow prevention assemblies are often installed to isolate equipment and/or systems that utilize water in a way that is not potable. You may have several equipment items or systems on your property that could contaminate the potable water supply or your internal water supply if a backflow prevention assembly is not installed. Common examples of this are landscape irrigation systems and fire sprinkler systems. In both examples, potable water is being used in a way that is no longer potable. Dirt and chemicals can enter the landscape irrigation system through sprinkler heads and flow back into the drinking water supply. Fire sprinkler systems are often designed where water stagnates in the sprinkler pipes, often leading to bacterial growth and high concentrations of metals leached from the pipes to the water. Environmental Health Services will send a test notice for each assembly that you have on your property. If you are unsure and have questions about the number and type of assemblies you have on your property, you can call (650) 372-6200. If you know of more backflow assemblies on your property than you have received notices for, please notify Environmental Health Services. We may not be aware of an assembly, or it may (inadvertently) have been assigned a different anniversary testing date, which could cost you more in the long run if a tester has to make more than one trip to your property. 7. This is the first time I am receiving a backflow prevention assembly test notice, but I have been the property owner for more than a year. If you have received a test notice for the first time but have owned the property for a length of time, we may have been notified by the water purveyor that there is a backflow prevention assembly on your property that has not been tested and was not in our inventory of assemblies. Backflow prevention assemblies need to be tested at least annually in accordance to Section 7605(c) Title 17 of the California Code of Regulations (CCR) and Section 4.72.070 of the San Mateo County Backflow Prevention Ordinance. You may have a backflow prevention assembly that is installed on a plumbing line supplying water to a fire sprinkler system. Historically, backflow assemblies isolating a fire system were only required to be tested upon installation or repair (interpretation is that this may have been in violation of CCR Title 17). Therefore, Environmental Health Services recently adopted (February 2013) a revised Backflow Prevention Ordinance that requires all testable backflow prevention assemblies, including assemblies installed on fire systems, to be tested at least annually in compliance with CCR Title 17. 8. I have received a cross connection control survey (or a link to an online survey) in the mail. Why did I receive this? Environmental Health Services and your water purveyor are required by the State Resources Control Board, Drinking Water Division (formerly under California Department of Public Health) to determine where cross connections may exist between the approved domestic water supply and sources of contamination through which backflow can occur, and to conduct a comprehensive survey of the water supply system. For residential services, Environmental Health Services and your water purveyor may send a survey or a link to an on-line survey to be filled out by the property owner/water customer by the date specified. If Environmental Health Services does not receive a response to this survey, you may be required to install a backflow prevention assembly at each of you water service meters to provide protection to the public water system. It is in your best interest to fill out the survey by the specified date. If you are having trouble filling out the survey on-line, you may call (650) 372-6200 and ask to have a paper survey mailed to you. 9. How should a backflow prevention assembly be installed? Backflow prevention assemblies must be installed as directed by Section 603.3.4 of the Uniform Plumbing Code with “a minimum of 1- foot between the lowest portion of the assembly and grade, floor or platform. Installations elevated greater than 5-feet above the floor or grade shall be provided with a permanent platform capable of supporting a tester or maintenance person.” There also must be sufficient clearance around the assemblies in order to provide access for annual field testing. In addition, backflow prevention assemblies must only be installed in an orientation for which they were approved. All backflow prevention assemblies must be USC-approved and installed in accordance to the requirements that they are approved. For a list of current USC-approved assemblies, please go to: http://usclist.com/. 10. 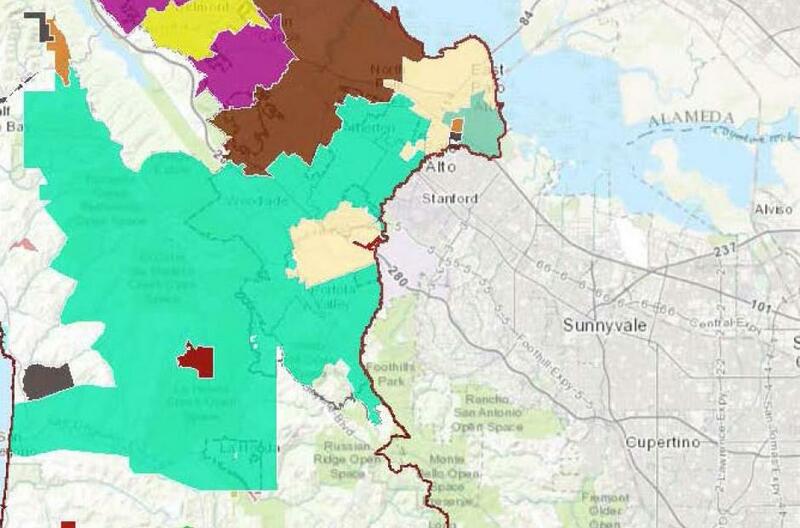 Which water purveyors are part of the San Mateo County Cross Connection Control Program? See the top of this page. 1. Why do I need to have my backflow prevention assembly tested? Backflow prevention assemblies need to be tested at least annually in accordance to Section 7605(c) Title 17 of the California Code of Regulations (CCR) and Section 4.72.070 of the San Mateo County Backflow Prevention Ordinance, to ensure they are working as designed. Water purveyors (your local water system) are required by the State Resources Control Board, Drinking Water Division and the Environmental Protection Agency (EPA) to ensure that the public drinking water system is protected from contamination by having a cross-connection control program in place, and to ensure backflow prevention assemblies are tested at least annually. Over time, internal elements of backflow prevention assemblies may stop functioning properly, and can allow contaminates and pollutants to flow back into the potable water supply in a backflow condition. This is another reason why it is important that backflow prevention assemblies are tested annually. The property owner (assembly owner), not the water purveyor, is responsible for testing the backflow prevention assembly. 2. How often is a backflow prevention assembly supposed to be tested and who can test backflow prevention assemblies? Backflow prevention assemblies are required to be tested at least annually (and upon installation or repair) in accordance to Section 7605(c) Title 17 of the California Code of Regulations (CCR) and Section 4.72.070 of the San Mateo County Backflow Prevention Ordinance. 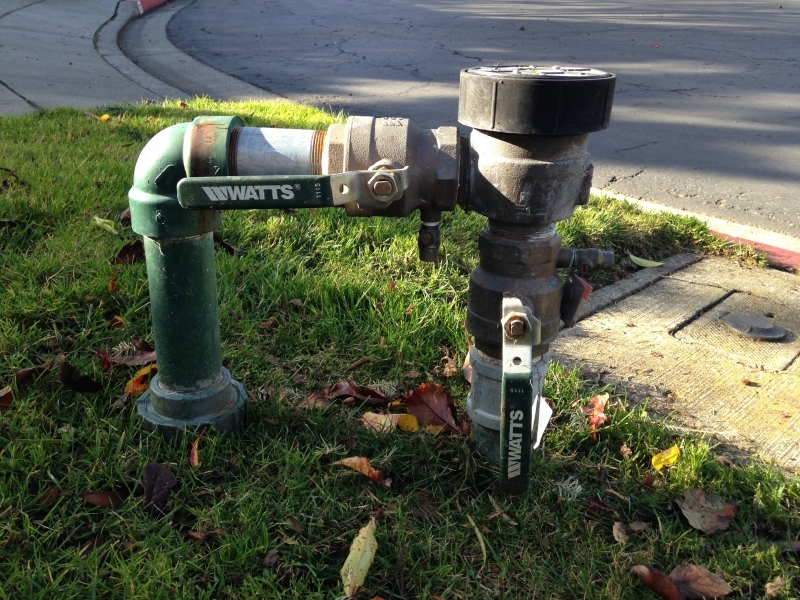 Only a County-certified Backflow Prevention Tester can test backflow prevention assemblies within the jurisdiction of the San Mateo County Cross Connection Control Program . See our list of water purveyors that are part of the San Mateo County Cross Connection Control Program. County-certified Backflow Prevention Testers are independent contractors that set their own price to test backflow prevention assemblies. Environmental Health Services encourages you to call County-certified testers to obtain quotes for the test. 3. What will happen if I don’t have my backflow prevention assembly tested? In addition, by not testing your annual backflow prevention assembly on an annual basis, you may be putting yourself as well as your neighbors and the public drinking water system at risk. 4. 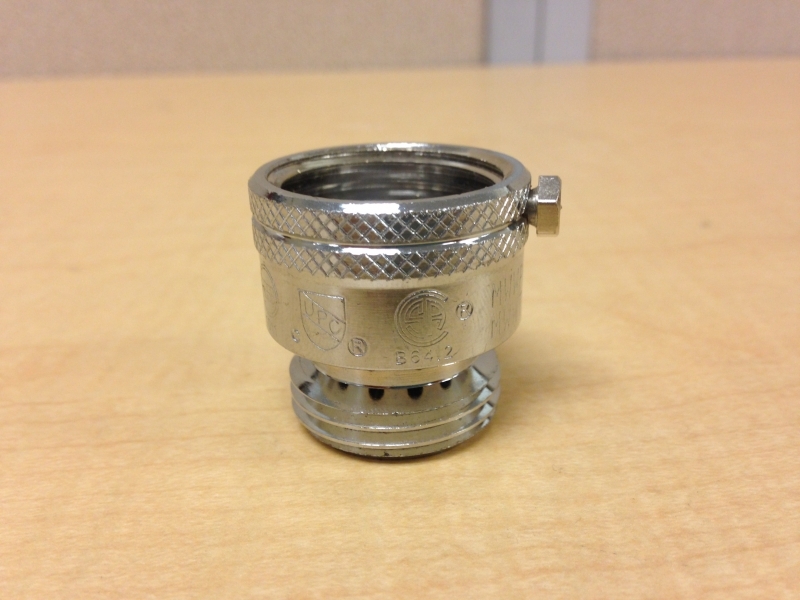 What do I do if my backflow prevention assembly fails the annual field test? The County-certified tester should notify you if the backflow prevention assembly fails the annual field test, and the tester should notify Environmental Health Services by submitting the field test report form to our office within 10 calendar days of the test. You will receive a notice from the county to repair or replace your backflow prevention assembly within 30 calendar days. 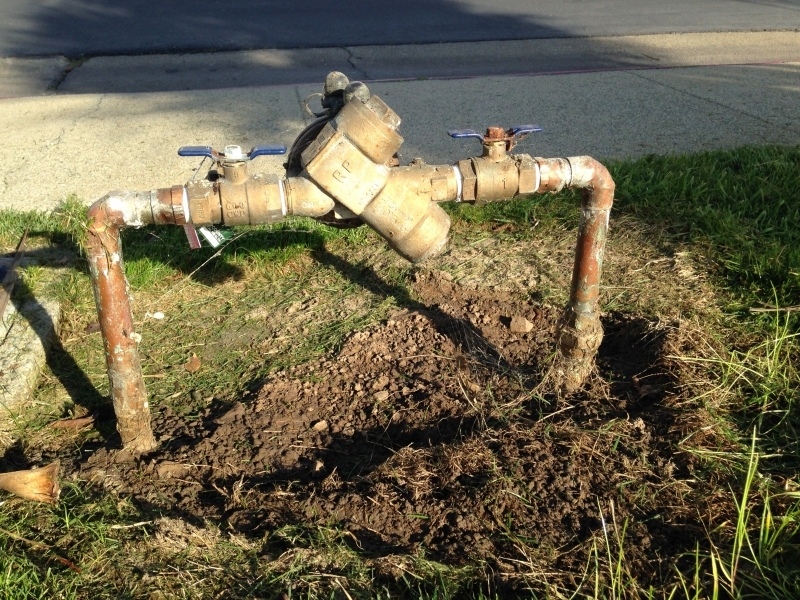 After repair or replacement, you will be required to retest your backflow prevention assembly and submit the results to San Mateo County Environmental Health Services. 5. What happens if I do not get my backflow assembly tested even after a third notice? By the time the third notice is issued, the backflow assembly is already delinquent. If the assembly has still not been tested 14 days after the issuance of the third notice, the County may issue an Enforcement Order and Administrative Fine of up to $500 per day, per assembly, and will notify the water department who will hang a tag on the owner’s door specifying when the water service may be terminated. 6. What is the due date by which I need to have my backflow prevention assembly tested? First Notices to test an assembly are sent 30 days prior to the anniversary test date of the assembly. Second Notices are sent approximately on the anniversary date of the assembly. The backflow prevention assembly is legally delinquent and in violation if not tested within 30 days after the assembly anniversary date. If you have received a Third Notice or Administrative Enforcement Order, the assembly is already delinquent and the assembly owner could be assessed Administrative Fines of up to $500 per day, per assembly, as specified in Section 4.72.130 of the San Mateo County Backflow Prevention Ordinance. If you need an extension, please submit a request for an extension in writing by e-mailing backflow@smcgov.org. You will need to provide an explanation as to why are requesting an extension. Extension requests will be handled on a case by case basis and you will receive notification of the approval or denial of the extension in a written response. Please note that the request for an extension must come from the assembly owner, not from the contracted assembly tester. 7. I had my backflow prevention assembly tested already this year. Why am I still receiving test notices in the mail? You may be receiving test notices from Environmental Health Services if we have not received a copy of your test report form. Check with the backflow prevention tester to ensure that they have sent Environmental Health Services a copy of your backflow test report. You may also be receiving a test notice after you have already tested, if we sent out a second or third notice before we were able to enter the results of your backflow test report form into our database. In this case, please disregard the test notice. You may have more than one backflow prevention assembly on your property and not all of the assemblies were tested, or passed the test initially. For clarification, you can e-mail your questions to backflow@smcgov.org. 8. I have sold my property to another owner, but I am still receiving a test notice for a backflow prevention assembly. What should I do? The water purveyor may not have informed Environmental Health Services of the water customer changes. Please contact Environmental Health Services at backflow@smcgov.org to inform us of this change. Please tell us your name, site address and if possible, reference your Facilities ID number that is located on the test notice (e.g. FA0012345). 9. How do I change owner and/or mailing information on the test report form? If the information is incorrect on the test report, you can either note this directly on the test report form that is submitted to Environmental Health Services, or you can e-mail backflow@smcgov.org. Once we receive this information, Environmental Heath Services staff will make the changes in our database. 10. I am a backflow prevention tester, and I am interested in becoming a tester on your list. To become a County-certified tester, you must be a Certified Backflow Tester and possess valid certification with the California-Nevada Section of the American Water Works Association (CA-NV AWWA) or equivalent certification as determined by Environmental Health Services. Please submit proof of valid certification along with a completed by e-mail (backflow@smcgov.org or fax to (650) 627-8244. Once we receive the application, Environmental Health Services staff will review your application and contact you by phone or e-mail to schedule an exam. Our exam consists of an oral and written component. There is no hands-on testing component of the exam. The annual fee covers the cost to take the exam and is pro-rated by month.